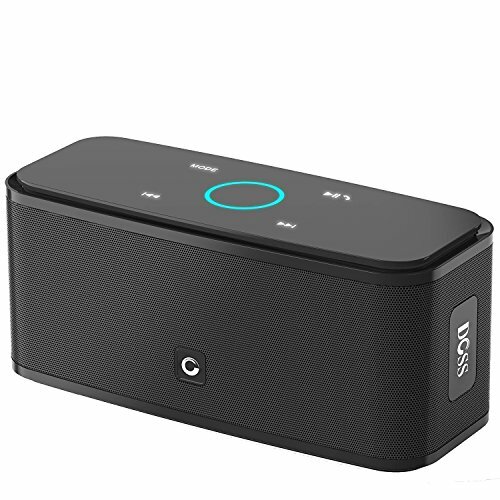 If you are looking for an affordable, handy, and portable speaker that can link with your Bluetooth enabled smartphone or device, the DOSS Soundbox Touch may be the right choice for you. The Touch is suitable for home and business use; however, throughout our review, we will be focused on how well the unit performs as a portable audio solution. By the conclusion of this review, you will have an unbiased 360-degree view of what this unit can, and can’t, offer you. Out of the box, the first impression of the DOSS Soundbox is that it is visually pleasing with a higher end design. The aesthetics are minimal unless you choose one of the patterned colors, and the touch controls are a nice addition. It won't be an eyesore in whatever room or environment you have it in, and it won't scream cheap. Without ever turning it on, you feel you're getting your money’s worth. With regards to functionality, the touch controls are a major draw, and the reason the speaker has its name. Visually they are not intrusive, they react quickly, and do their job. 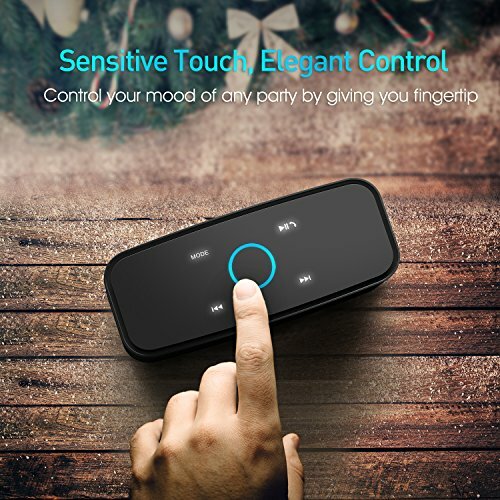 Bluetooth pairing was a breeze, and although there are scattered reviews about connective issues they are far and few between. Keep in mind; your device signal plays a role in pairing strength. The inclusion of a micro SD and Aux input are nice touches. They add a layer of versatility not commonly provided in this price range. On the top right is the pause, play, and speaker disconnect button. The bottom two identifiers are used to skip left and right, while the center LED lit control manages the volume. When the unit is rotated to the rear, you find its power button, a connector port, and micro USB input. There is an LED underneath the USB port to indicate when the unit is charging. The light will also tell you when charging is complete. However, it is obstructed when the speaker is plugged in. You have to lift it to check the charge, and we feel that is a bit of a nuisance. There is also a slot marked TF Card, dated wording, we know, but it is meant to take a micro SD card. The Touch does not come with a wall adapter for charging, so you will have to use a bank you have on hand to charge it. We feel the lack of a bank is forgivable at this price. The top and the bottom of the speaker have a simple and clean matt finish. It looks as if there is a base radiator or upward pointing roofer; however, that is purely for aesthetics as there are no actual openings. Still, we appreciate the attention to detail. The Touch produces quality HD sound and bass. The portable listening experience is impressive when compared to similarly priced units. It has two, 6-Watt high-performance drivers. The incorporation of an enhanced bass setup gives the speaker a full-bodied soundstage with a minuscule one percent harmonic distortion. The unit is outfitted with a 2200 mAh lithium-ion battery. Its expected life is around 12 hours. Realistically you will get about fourteen hours at 50 percent volume and perhaps nine or ten hours at the highest volume. Once drained, a full charge takes about four hours. Out of the box, you can be up and running within 3-hours since the unit comes partially charged. The play life on the battery is actually at the higher end of wireless Bluetooth portable speaker performance. At 50 percent volume, only models like the Samsung Level Box Mini will do better, while the Touch gives the UE Boom and Sony X33 stiff competition. The Bluetooth connection is solid from a maximum of 33 feet away. Walls and stairs don't seem to be a barrier to the signal whatsoever. As mentioned before, using the 4.0 Bluetooth technology on the Touch is optional. It can be used wired via the included auxiliary cable or function off of a micro SD. However, let’s be real, we came for the Bluetooth, so we plan to use it. Pairing is simple, just enable Bluetooth on your device and hold the play button on the Touch to pair. You will see DOSS on your devices list of Bluetooth connections for selection. When the center control blinks in alternate colors, you are ready to go! There are also voice commands, so you are not fully dependent on visual cues. Once you have initially paired the unit to your device, it will auto-pair for future use. We covered the basics of the touch controls earlier, but let's get into them in more depth. On the top of the device is the capacitive touch control. The face is small and sleek. It is used to play, pause or skip tracks. All options are clearly identified and back or LED lit. The center dial controls the volume. Swiping it in a clockwise motion raises the volume, and counter-clockwise motion turns it down. We like the innovativeness of the design, especially for a budget speaker. The touch controls function well and are sensitive. They do not present any latency problems. Many people flock to the Touch because it has a high rating for outdoor use. 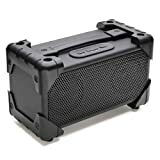 However, this speaker is not waterproof at all, so it is best suited for sunny days and situations where there is no chance it will be splashed or moistened. That said, the overall construction is solid. There are no loose parts, rattling, clicking or anything that seems like it may become an issue down the road. Still, it is not what we would call rugged. For example, the slick top panel seems it would scratch and scuff easily over time. Obviously, more than anything, the most important aspect of the DOSS SoundBox Touch is how it sounds, so let's get into the meat of this review. When you buy a speaker for so little money, expectations are understandably low. However, surprise surprise, the sound quality is pretty good. Audiophiles may still want to beware, the soundstage is solid, but not studio quality – just ultra special for what it is. It seems to perform equally well throughout all genres. The tones are clear and crisp, and the bass is strong, but not overwhelming. The bass can’t be adjusted, but it does thump enough to be noted as impressive. Impressive, not sub bass vibrating levels, but sufficient. At higher limits, you don't hear any distortion, perhaps because the speakers' construction is very solid and united. It is also loud, shockingly loud, so you should not have to jack it all the way up. We do warn against sitting too close to the speaker. As with most portable speakers, the soundstage will disappear at ultra-close ranges. It can be safely said these deliver audio you might expect from a speaker twice as expensive. The DOSS Soundbox Touch can be purchased online and in stores. eBay and Amazon are the most reliable online suppliers. The price of the speaker can vary greatly from retailer to retailer. The general range is from as little as $30 to as much as $70. Shopping around for the best price would be wise. 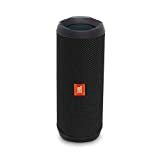 The JBL Flip 4 is a highly durable portable Bluetooth speaker with a sporty look. Its sound is reasonably powerful considering how compact it is. It is made of waterproof materials, making it ideal for outdoor use. 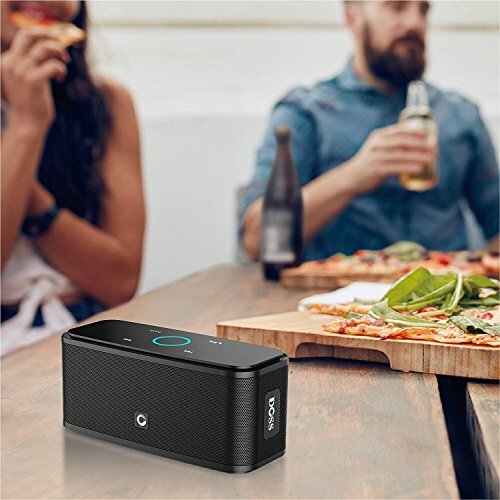 It features a 3000mAh rechargeable li-ion battery, dual external passive radiators, and JBL connect+ so you can connect it to other JBL connect+ enabled speakers. 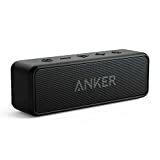 The Anker SoundCore has a solid play with less than 1% total harmonic distortion even when the speaker is at higher volumes. It has the longest battery life on our list at an impressive 24 hours per charge. The unit features Bluetooth 4.0 connectivity, dual high-performance drivers, spiral bass port, and a built-in mic for hands-free calls. 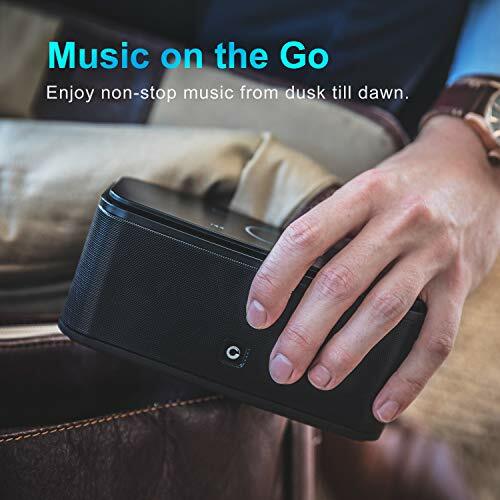 Overall the DOSS Touch Wireless Bluetooth V4.0 Portable Speaker is user-friendly with a robust sound. The fact it is able to play a variety of music genres well makes it suited to almost every user. That said, we would recommend it for indoor use over outdoor and advise you to handle it carefully. We can understand the hype around it and why it has become a favorite of music lovers. 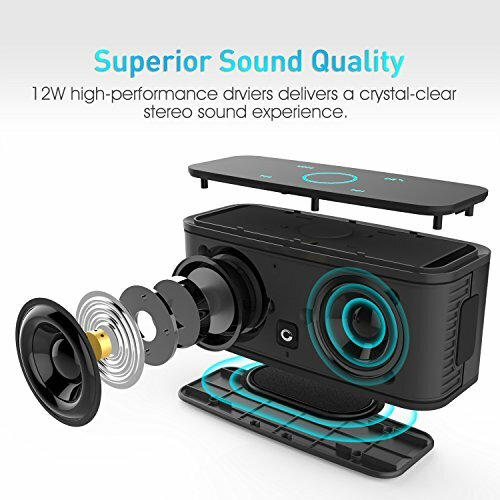 You will most likely be pleased with the device as long as you are not seeking studio-quality sound, and you definitely will get plenty for your buck. We found the DOSS Soundbox Touch attractive, solid, efficient, and a competitive choice against speakers outside of its price range. Within its price range, it may be one of, if not the top choice available currently so we give it a 5-Star rating. 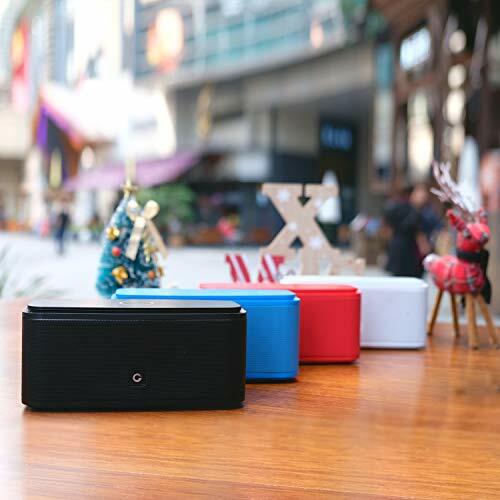 The DOSS Soundbox Touch has a Twelve-hour battery life at higher volume feature that enable users to play this speaker for a long term use and you can charge this product for only for hours or less. So its relatively quick. However, it is not waterproof. So it can be distorted easily when drowned in water.